SALLABERRY (Salaberry), MICHEL DE, naval officer, shipowner; b. 4 July 1704 in the parish of Saint-Vincent, Ciboure (dept. of Pyrénées-Atlantiques), France, son of Marsans de Sallaberry and Marie de Michelance; d. 27 Nov. 1768 at Salles near La Rochelle, France. Michel de Sallaberry was descended from a branch of the noble house of Irumberry in French Navarre. The details of his early life remain unknown, but he may have accompanied his father to Quebec in 1733. Two years later Sallaberry was identified as a ship’s captain and had established a residence at Quebec. In 1736 he launched his own ship, the Saint-Michel. a 68-ton brigantine, and began to carry cargoes to Île Royale (Cape Breton Island). Soon he was sailing larger ships to Martinique, Saint-Domingue (Hispaniola), La Rochelle, and Bordeaux. In 1741 he launched a second, larger ship. Until the outbreak of war with England, Sallaberry was an active member of New France’s commercial maritime community, voyaging to all parts of the French American empire. In 1745 he was to have sailed a large merchantman from La Rochelle to Quebec but owing to the War of the Austrian Succession the ship’s owners cancelled the voyage. In mid-November, after a naval frigate commanded by Jean-Baptiste Legardeur de Tilly had failed to reach Quebec, Sallaberry offered to outfit and command the small schooner Marie to carry dispatches and munitions to New France. Sallaberry encountered severe storms during the crossing and early in January, after reaching the French island of Saint-Pierre off the south coast of Newfoundland with his ship badly damaged, he saw no alternative but to make for the West Indies for the winter. In the spring, at Martinique, Sallaberry refitted his ship and left for New France escorted by a French privateer. He reached Quebec on 6 June 1746. During the summer he patrolled the mouth of the St Lawrence River off Cap Chat watching for an English invasion fleet that was rumoured to be heading for Quebec. Towards the end of the year along with several other ship’s captains he was to have transported military supplies to Baie-Verte in Acadia, but he ran aground only 15 leagues from Quebec. On 20 May 1748, Sallaberry was commissioned flute captain for his services and abandoned maritime trade in favour of a career in the navy. In 1750 he was serving in the frigate Anglesea when it called at Quebec. Two years later he obtained command of the armed transport Chariot Royal on a voyage to Louisbourg, Île Royale. In November 1755 this ship was captured by the English and he was taken to London. As France and England were still technically at peace he was soon released and returned to France. On 20 Nov. 1757, he was promoted to the regular naval rank of lieutenant-commander and given command of the frigate Fidèle . The following summer he cruised off Louisbourg and during the siege his ship was sunk in the mouth of the harbour. After the Seven Years’ War, Sallaberry retired to Salles near La Rochelle where he lived with his daughter Angélique. In 1766, only two years before his death, he was made a knight of the order of Saint-Louis and a year later was awarded a pension of 1,000 livres. On 17 May 1735 Sallaberry had married Marie-Catherine Rouer de Villeray, a widow with several children. She died five years later leaving him with only a daughter. A decade later, 30 July 1750, he remarried, at Quebec, Madeleine-Louise Juchereau Duchesnay de Saint-Denis. The one son from this marriage inherited land from his mother and remained in Canada to become founder of the family of Irumberry de Sallaberry. Michel de Sallaberry did not own land in New France. His marriages had provided his major ties with the colony. His marine and naval careers reveal him as a participant in the French empire rather than as a resident of New France. ANQ, Greffe de C.-H. Du Laurent, 30 juill. 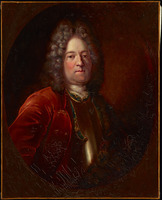 1750; Greffe de J.-N. Pinguet de Vaucour, 13 mai 1735; AP, Famille Salaberry, 1641–1896. Archives paroissiales de Saint-Vincent (Ciboure, dép. des Pyrénées-Atlantiques, France), Registres des baptêmes, mariages et sépultures, 4 juill. 1704. P.-G. Roy, Inv. coll. pièces jud. et not., I, 105, 110, 141; Inv. jug. et délib., 1717–1760, III, IV, V.
James S. Pritchard, “SALLABERRY, MICHEL DE,” in Dictionary of Canadian Biography, vol. 3, University of Toronto/Université Laval, 2003–, accessed April 24, 2019, http://www.biographi.ca/en/bio/sallaberry_michel_de_3E.html.